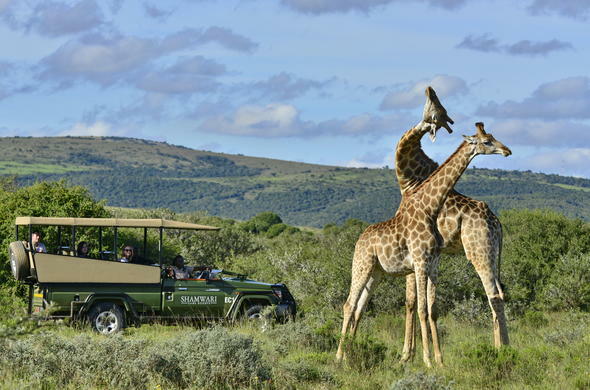 Hidden away in the African bush of the Eastern Cape in South Africa one will find the luxurious Shamwari Game Reserve. Situated in the malaria-free Eastern Cape Province, just off the N2, Shamwari, which means 'my friend' in the local Shona language, is an easy 90 kilometre (56 mile) drive from Port Elizabeth. Spanning across 25 000 hectares of magnificent African bush, Shamwari welcomes visitors with warm smiles and open arms. Specialising in luxurious, sophisticated and unforgettable safari experiences, every detail of the accommodation, guest amenities, game viewing experiences, gourmet meals and spa treatments have been expertly crafted and perfected to ensure that your time spent at Shamwari is tailor-made to suit your needs and desires ensuring you leave feeling relaxed, pampered and full of stories about your incredible visit. There are 6 very unique and different lodges in Shamwari Game Reserve. Eagles Crag is nestled away at the base of a mountain and is surrounded by lush green trees which add to the wonderful sense of isolation and freedom. Magnificent fully equipped suites with rim flow pools and views out into the bush provide the perfect accommodation for your stay. Offering a more tranquil, 'back to nature' atmosphere, Villa Lobengula is a sanctuary for the weary soul offering delicious meals prepared with home grown and organic produce and rejuvenating holistic treatments and yoga sessions. Lobengula is the ideal lodge for those needing a respite from the busy world. Allow the peace and tranquillity of the African bush to soak into your every pore. Long Lee Manor brings the elegance and sophistication of a bygone colonial era to the rustic environment of the Africa bush. A magnificent, gracious salmon and white Edwardian Manor house welcomes you as you walk across the beautifully manicured lawns. If you are looking for a safari experience that combines the elegance and sophistication of modern day life with the romance of a colonial bush adventure, then Long Lee Manor will tick every box. The family friendly Riverdene Lodge offers elegant accommodation in a restored frontier homestead and visiting families will relish the relaxed atmosphere and happy times spent relaxing around the rim-flow pool as the littlies play in the shallow area or on the jungle gym. Organised activities for the children provide plenty of opportunity for parents to relax and enjoy their surroundings safe in the knowledge that the children are having a wonderful and memorable time in the African wilderness, learning about their surroundings and making new and special friendships. Ideal for groups travelling together or a large family, the environmentally friendly Sarili Lodge is the newest of the Shamwari lodges and offers a cool contemporary bush experience. Relax in the middle of the afternoon on your king size bed and gaze out across the Bushman's River below, savouring the restfulness of a hot African afternoon. Spend time in the evening chatting with your friends about the latest sighting or game viewing adventure, or relish the serenity of your private suite, Sarili offers the ideal setting for your safari escape. Bayethe Lodge (pronounced 'By-ye-ti) is a luxurious tented lodge that allows the beauty of outdoors to weave through the indoors providing a sense of being right in the middle of the rich vegetation that surrounds you. The name Bayethe means 'I salute you' and offers a warm African greeting to all its visitors. Secluded and seductive, Bayethe offers 12 detached tents each with their own private deck and plunge pools. Enjoy a relaxed afternoon siesta in the hammock outside your room as the birds chirp a lullaby for you. Aiming to ensure you have the safari of a life time, each group of 6 guests at any of the lodges at Shamwari has access to their own personal game ranger, ensuring your daily safari experience is tailor-made to suite your needs. Highly skilled and trained, the enthusiastic game rangers will be happy to impart their excitement and passion for the African bush on you, happily chatting away about the tiniest of beetle to the largest of beasts.Aside from daily morning and evening game viewing experiences, visitors can also enjoy spending time relaxing by the swimming pools, being pampered during a spa treatment and enjoying the carefully prepared cuisine made from fresh local ingredients using local traditional recipes that take you on a gourmet exploration of South Africa's culinary heritage. For those wanting to work off some of the decadent food guided game walks are a fantastic way to fully immerse yourself in the bush - walking along the same pathway that an Elephant used only a day before is exhilarating.